Take Away the A | What is ML Reading? On each page spread, one letter is removed from a word to form another word. When you take away the letter “b” from bride? The new word is ride. More specifically, “the BRIDE goes for a RIDE.” The illustrations comically portray phrases created. For example, the bride is pictured riding a ferris wheel with her veil flowing in the wind. The groom is in the chair behind her. It’s unclear if she is running away or not. I’ll leave the decision up to you. Pay careful attention to the facial expressions before determining your answer. Read this book. Then, create your own word play. My first letter subtraction attempt… “PLAY this game. No need to PAY.” What’s yours? 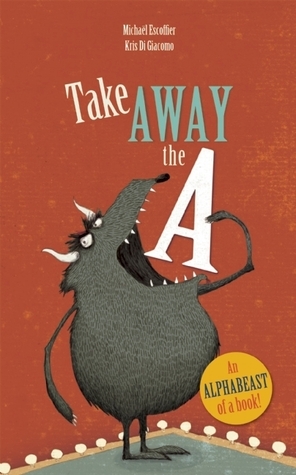 This entry was posted in Picture Book and tagged Kris Di Giacomo, Micheal Escoffier, Take Away the A: An Alphabeast of a Book! by mlreads. Bookmark the permalink.